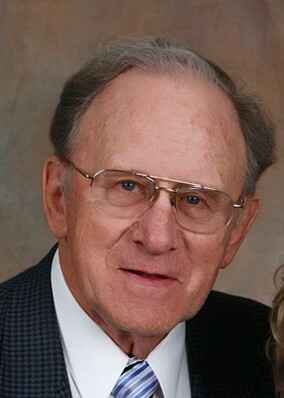 Obituary for E. Lloyd Behr | Fleming & Billman Funeral Directors, Inc.
Dr. Edward Lloyd Behr, age 91 of Kathleen Dr., Jefferson, passed away Tuesday, October 9, 2018 at the Ashtabula County Medical Center. He was born on March 16, 1927 in Detroit, Michigan, the son of Albert & Ethel (Johnson) Behr. He served as a corporal in the United States Army in Air Transport Command during the end of World War II. Feeling called to be a teacher, he earned his bachelor’s degree in Music Education from Olivet Nazarene University and a Doctorate of Education from Wayne State University. For the next 50 years he was a passionate teacher, principal, professor and superintendent. While he was working as an educator, he also served the Church of the Nazarene as a minister of music. He was a member of the Jefferson United Methodist Church, the American Legion and Jefferson Chamber of Commerce. He is survived by his wife of 66 years Jean L. Behr of Jefferson; children, Carolyn (Linc) Jerome of Jefferson, Daniel E. (Coralee) Behr of Howard, OH; siblings, Douglas Behr, James “Jim” McCormick, Joyce Warner; 5 grandchildren, Aaron Behr of Vicksburg, MI, Andrew (Lydia) Behr of East Liverpool, OH, Adam (Danae’) Behr of Uniontown, OH, Grace and Zane Jerome both of Jefferson; great-grandchildren, Lilliana, Autumn, Willow, Oliver and Gabriella Behr. He is preceded in death by his parents and a grand-daughter, Carmen Jerome. A Memorial Service will be held Saturday, October 20, 2018 at 12:00 P. M. at the Jefferson United Methodist Church, 125 E. Jefferson St., Jefferson with Pastor Douglas Winner officiating. Visitation will take place from 11:00-12:00 P. M. at the church prior to the service. In lieu of flowers contributions can be made to the chancel choir of the United Methodist Church, at the above address, envelopes will be available at the church. The Jefferson Home of Fleming & Billman Funeral Directors and Crematory are honored to serve the E. Lloyd Behr family. Obituary, guestbook and condolence expressions can be found at fleming-billman.com.